Recently, Barbara D'Urso and French star Christopher Lambert were photographed together which sparked rumors of their relationship. Barbara immediately claimed there was nothing between her and Lambert except for friendship that appeared on the set of Italian TV series “La dottoressa Giò” (“Dr. Gio”) revival, which brought the two actors together last summer. Yet, it was during the filming, when the actor of “Highlander” was enamored with another Italian beauty, his colleague Camilla Ferranti. And Barbara apparently played the role of a cupid for the couple! READ ALSO: Did Aubrey O’Day Write A Song Titled ‘DTJ’ About Her Affair With Donald Trump Jr.? Christopher has a history of falling for Italian women, which is evidenced by his former sweetheart Alba Parietti, whom he dated in 1996 and again in 2016. This time, however, there is a substantial age gap involved. Christopher is about 22 years older than Camilla! The actor is 61, while Camilla is 39. But at the moment, the numbers don’t seem to bother the lovebirds at all. READ ALSO: Michael Douglas and Catherine Zeta-Jones Prove Age Difference Is No Obstacle For True Love! Still, Lambert has reasons to worry. He has every right to be jealous, as there are plenty of other successful and younger men around Camilla. 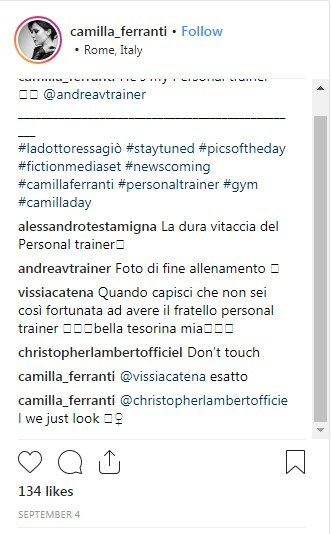 For example, here is a photo of Camilla with her coach she posted a few weeks ago. …and an exchange between the movie couple in the comment section. And what do you think of the age gap between the two? Will it work? Let us know what you think in the comments!